Livingly Media is the definitive platform for women seeking inspiration on the things that matter most to them. 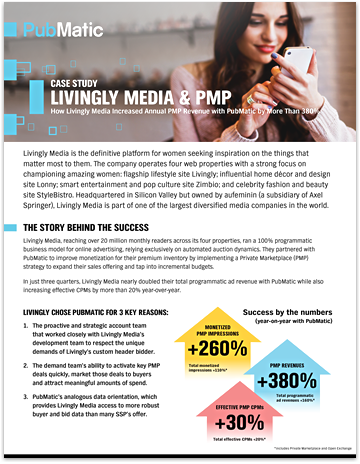 Headquartered in Silicon Valley, Livingly Media reaches over 20 million monthly readers across its four properties. They ran a 100 percent programmatic business model for online advertising, relying exclusively on automated auction dynamics. After partnering with PubMatic to improve monetization for their premium inventory by implementing a Private Marketplace (PMP) strategy, they were able to increase their annual PMP revenue by more than 380 percent. Learn how in this case study.